Izo FitzRoy is one of the UK’s leading Voice and Dialect Specialists. Currently working as Dialect and Voice coach on the RSC’s ‘Matilda The Musical’, Izo brings a wealth of skills and experience to her work. In 2017, Izo completed the ‘Experiencing Speech’ and ‘Phonetics Intensive’ modules as part of the Knight-Thompson Speech Certification process, and is due to complete the qualification in August 2018. Knight-Thompson Speechwork is a highly effective, skills-based approach to speech and accent training that places emphasis on developing the speaker’s detailed awareness of – and deep engagement with – the precise physical actions which make up speech. In 2010 she graduated from the prestigious Royal Central School of Speech and Drama with an MA in Voice Studies. She has since worked at a number of renowned drama schools and universities throughout the UK including: Bristol Old Vic, Royal Central School of Speech & Drama, Mountview Academy of Theatre Arts and Arts Ed. 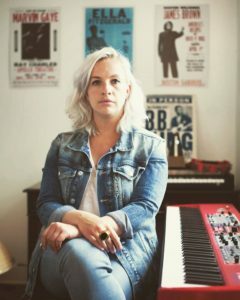 Prior to her training in voice, Izo originally completed an MA in European Civilisation at the University of Glasgow, alongside a BA in Music Composition at the Royal Conservatoire of Scotland in Glasgow. Whilst studying in Glasgow, Izo set up her own Gospel choir, Great Sea Gospel Choir and began to work on her own music. When time and voice coaching commitments permit, she still performs with her band www.izofitzroy.com, and with Great Sea Gospel Choir. Izo is a member of VASTA (Voice and Speech Trainers’ Association), ICV (International Centre for Voice) and BVA (British Voice Association), and holds an IPA certificate in Phonetics.